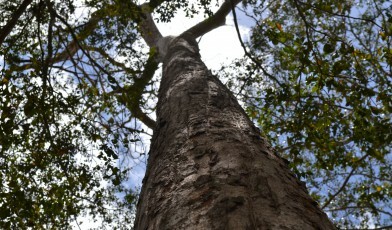 Karomia gigas is one of the world’s rarest trees. It is now only known to exist in south-eastern Tanzania, but previously also grew within Kenya. The species is believed to be extinct in Kenya as the last known specimen was cut down in the 1970’s. Until 2012 the species was also thought to be extinct within Tanzania but in this year botanists from the University of Dar es Salaam rediscovered the species, 28 km away from a previous collection site. A second site of the species was found in 2017. Across both locations fewer than 20 individuals of Karomia gigas exist and consequently the species is assessed as Critically Endangered on the IUCN Red List. Karomia gigas is a tall tree that produces large, oval, papery seeds. Overall, little is known about the species. It is suspected that a decline in its native habitat, as forest was converted to agricultural land, caused its population to decline. Conversion of forest remains a threat to this species. Historical decline in the species is also potentially caused by wood cutting for fuel and timber. Logging still occurs locally and is a continuing threat to the species. 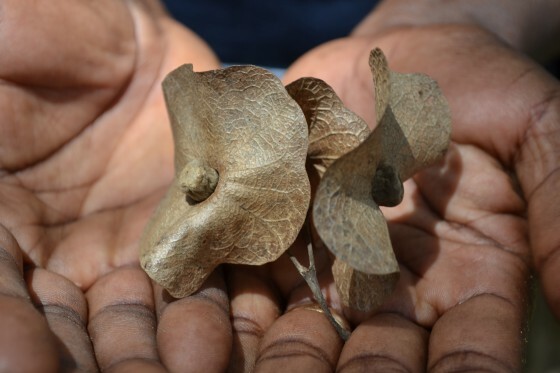 The Tanzania Tree Seed Agency, the Tanzania Forest Service and three botanic gardens: Dar es Salaam Botanic Garden, Tanga Coastal Forest Botanical Garden and Missouri Botanical Garden and Global Trees Campaign are working to protect and conserve the remaining Karomia gigas individuals. The collaboration aims to establish ex situ seed and living collections to ensure a future for this species.